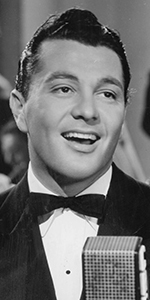 Tony Martin was a singer and Big Band leader who made a number of appearances in films, and whose career spanned decades. Newly wed to actress / singer Alice Faye, the pair were imprinted together in a single ceremony. Born to a large Eastern European Jewish family, Alvin was given a saxaphone by his grandmother when he was ten. The young lad took to the instrument quickly; he also learned to sing while in a grammer school glee club. By high school, he had formed a band called "The Red Peppers." He got a gig with local bandleader Tom Gerun, playing reeds. Also learning the ropes was fellow bandmate Woody Herman. It was while playing in the Tom Gerun Band that Alvin attended Saint Mary's College of California. After graduating, he changed his name to Tony Martin, and headed south to break into the movies in Hollywood. To try him out with audiences, Martin was cast in an R-K-O short film Foolish Hearts (released in in 1935). R-K-O gave him some walk-ons, but let his contract lapse. 20th Century-Fox gave him a try, placing him in a bit part in the Shirley Temple picture Poor Little Rich Girl (which played the Chinese in July, 1936). 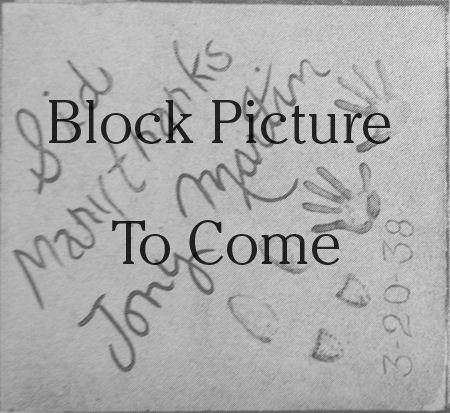 It was here that Martin met and romanced Temple's co-star, Alice Faye. Martin was given a role in Alice Faye's next film, Sing Baby Sing (which played the Chinese in August, 1936), but his name didn't even make the poster. He was given a slightly larger role in the All-Star Fox musical Pigskin Parade (played the Chinese in November, 1936), then co-starred with Jane Withers in The Holy Terror (played in February, 1937). He became the headliner in his next film, Sing and Be Happy (played in July, 1937), but was only seventh billed in his next film with Alice: You Can't Have Everything (played in August, 1937). After Tony co-stared in Ali Baba Goes to Town with Eddie Cantor (which played the Chinese in November, 1937), Alice Faye and Tony Martin finally co-starred in a picture which had just played at the Chinese in March, 1938 called Sally, Irene and Mary, so Grauman had the duo come and make their imprints together in the Forecourt. Martin continued to play prominent roles in Fox films, such as Kentucky Moonshine (which played the Chinese in May, 1938), Up the River (played the Chinese in December, 1938), and Winner Take All (played in June, 1939). Martin got top billing over Rita Hayworth in Music in My Heart for Columbia (released in January, 1940). Co-star Andre Kostelanetz and Martin did a radio program together — Tune Up Time for CBS around this time. He finally slipped into an M-G-M musical Ziegfeld Girl in (played in April, 1941), and did a number in the Marx Brothers film The Big Store (played in July, 1941). World War II saw Martin joining the Navy, but a rumor circulating that he had tried to buy his way into officer's ranks caused him to join the Army Air Forces. Stationed in India, Martin entertained and staged amateur shows for the crews working the Hump Airlift. Martin became a very busy and popular recording star after the War, so his film appearences became less frequent, while guesting on many of the variety television shows of the era. He scored impressive performances in Till the Clouds Roll By (released in December, 1946), Deep in My Heart (released in December, 1954), and Hit the Deck (released in March, 1955). Divorced from Alice Faye in 1940, Martin married actress / dancer Cyd Charisse in 1948. Togther, they had one child and raised her child from her previous marriage. They remained married until her death in 2008 (that's 60 years!). Tony Martin continued on in the trouper tradition, performing into his old age. He died of natural causes in 2012 at the age of 98. Grauman's Chinese Theatre, Hollywood, California. Tony Martin / Alice Faye Forecourt ceremony, Sunday, March 20, 1938. 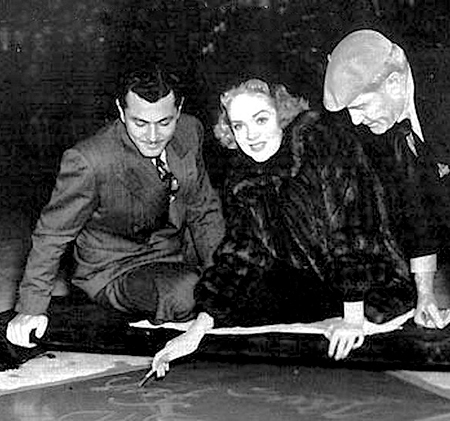 Tony Martin looks on as wife Alice Faye signs her autograph while cement artist Jean Klossner supervises.